It has taken me longer than expected to write this, but I finally have the last “Making of” post about my orange 1890’s dress to share! Part one can be seen here and shows the making of the bodice. Part two is posted here and focuses on the sleeves. This post will be about the skirt and some of the finishing details. I didn’t take a lot of photos of these steps but hopefully I took enough for it to make sense! Since I was unhappy with my previous 1890’s skirt attempt I decided to use a pattern for this one. I once again referenced 59 Authentic Turn-of-the-Century Fashion Patterns * , using the pattern from one of the ladies street costumes. Of course I altered it to match my measurements, but the shaping of the pieces is the same. Here is the finished pattern. The side and back pieces were both cut out twice and the front panel (the narrowest one) was cut on a folded edge of the material. After cutting it out from the material I assembled the pieces with french seams and roughly pinned them onto my dress form. I was originally a bit disappointed by the slim silhouette since SO much fabric went into this skirt, but I liked the shape enough to stick with it. I turned the top few inches of the back edge inward twice, so the raw edge was hidden. Then I sewed the edge down. I left this portion of the skirt open and sewed the rest of the back seam normally. Then I gathered the back of the skirt by hand. The silhouette looked a bit fuller after this, which I was happy with. However I was not happy with the length of this skirt, it’s a whole inch shorter than I had envisioned. There was no room to do the pretty hem I wanted. To make things even more annoying, the back was too long and had to be cut down. I had to scrap my ideas for a one inch rolled hem and chose to face the hem with some suiting instead. I sewed this on with a quarter inch seam allowance to keep the hem as long as I could. I don’t think this was a bad idea, but I should have used a lighter (or stiffer) fabric. This one didn’t iron smoothly and the hem ended up looking puckered even though I was very careful when sewing it. It bothers me to the point that I plan on redoing it soon, which is pretty drastic for me! After hemming the skirt I sewed loops and buttons onto the top portion of the back seam to keep the opening I left closed. I’m not sure where my pictures of that went, but the process was identical to adding buttons and loops to the sleeves. Then I sewed the bodice onto the skirt with the wrong sides facing each other, so the raw edges are on the outside. I covered the raw edges with a waistband that has a pleat running horizontally across it to add interest. It was originally supposed to be gathered but that didn’t look very nice so I pleated it instead! The final touch was adding a matching modesty panel to the back to hide the foundation garments that were peeking out from the loops the last time I tried it on. This is just a rectangle with the edges whip stitched inward, then it was whip stitched to the lining. And that was it! Here is the back all done up. Not historically accurate, but I love the buttons and how far down they extend. And pictures of it on the dress form – keep in mind that it doesn’t really fit my dress form, the silhouette is a lot more dramatic when I wear it over a corset. There is also a bit of petticoat peeking out since the hem was shorter than I had planned. Even though I was annoyed by this, it was kind of a blessing in disguise since it forced me to shorten my petticoats which were all way too long. Overall I really like this dress. I’m so happy with the fit, and how light it is. The fabric is beautiful and was wonderful to work with – even though the color isn’t my favorite, I like how striking it is. And the button details make me so happy. The only thing I don’t like is the hem, but I’m confident that can be fixed. With the dress discussion done, it’s time to talk about the hat! I’m not the biggest fan of hats from the 1890’s since I feel like they are out of proportion with the full sleeves. I looked through a lot of references and couldn’t find anything inspiring (except for the ones with birds on them…but one bird hat is enough for me, or at least for this year). At least until I came across this fashion plate – I’m not sure where this is from or if it was even drawn in the 1890’s, but I love how different it is. It’s like a twentieth century bicorne. I made the base from interfacing. I bound the seams by hand, then sewed wire into the edges. I made a cap from interfacing too. The cap was covered with brown silk and lined with cotton, then sewn to the brim. The brim is covered with brown silk as well, and lined with some leftover orange material. For decoration I used a peach ostrich feather across the top. And the side is decorated with fake roses, leaves, and some small brown feathers. It can be worn in a variety of ways – with the feather facing the front, or either side. I ended up wearing it like this and pinning a comb into the cap to keep it in place. And speaking of hats, I wanted to take a minute to mention the video I made about all my hats. It shows them in detail, along with how they look worn and a bit about the construction process/period they come from. If you like hats, you might enjoy it! It can be watched here. And I think that’s it for this post! The dress is done, the hat is done, and so are all the things that go underneath them. I’ve already photographed this project (in its natural habitat, a pumpkin patch) and as soon as I get done editing I will post them too! Today I have the second post about making my 1890’s dress to share. Part one can be read here and covers how I made the bodice. This post will be all about my nemesis: sleeves. When I made my first 1890’s dress I drafted the sleeve pattern myself and came up with something usable, but it wasn’t accurate at all. I have a habit of making sleeve patterns symmetrical, which is bad since they don’t cup the arm as well. So this time around I decided to copy a pattern from 59 Authentic Turn-of-the-Century Fashion Patterns* , specifically the sleeve pattern associated with this dress. The pattern consists of a large “puff” portion which is attached overtop a fitted sleeve. It’s a really strange design, but I thought it would be fun to try. Unfortunately the first mock up didn’t go well. The fitted portions didn’t really fit and the puff portion was tiny, the sleeves had barely any volume. I’m also not completely sure how you are supposed to attach the puff portion to the fitted sleeve. Soo I made some alterations. I made the puff portion a good six inches wider and longer. I cut the fitted sleeves off at the elbow and added seam allowance so they could be sewn together after attaching the puff. And I made them a bit smaller. I cut the lining for the sleeves out of muslin, then used the muslin as a guide for cutting out the taffeta. To avoid the lining bunching underneath the taffeta I cut the taffeta pieces to be slightly larger than the lining. I sewed these pieces together with half inch seam allowances but left the bottom few inches of one seam open since that’s where the closures will be. The edges of the portion left open were basted down and the bottom edge was hemmed by hand. I also ran basting stitches across the top edge to keep the lining in place. Then I sewed loops and buttons onto the sleeves. The the lining was whip stitched to the interior of the taffeta, so it covers the raw edges of the loops. The buttons are all sewn on with upholstery thread since I was kind of concerned about the strain they would go through when trying to button these up! I cut the puffed portions of the sleeves out, then gathered down the top and bottom edge. when they were gathered most of the way down I sewed them to the muslin lining, which is the top portion of the fitted sleeves. In between the muslin and taffeta I stuffed gathered strips of organza to help the sleeves hold their shape. Now the sleeves were a bit too poofy. They looked good when they were carefully arranged, but they didn’t stay looking that way for long. I ended up ripping out the gathering stitches at the shoulder, then cutting off more than three inches from the top of the sleeve. Then I sewed the top and bottom portions together. This seam was covered with bias tape. And now I had things that actually looked like sleeves! I gathered the tops down to be even smaller. And then I sewed them onto the bodice by machine. Unfortunately after doing that I realized I couldn’t bind the arm opening without making the opening too small, so i’ve left the edges raw, which really isn’t ideal. But the sleeves were cut on the fabrics bias so they don’t fray that much. Hopefully it will be okay for the limited amount of wear this will get. On the bright side, they fit! They have a habit of puckering around the wrist (I may have made them slightly too small) but I think they look pretty good! Please ignore the color this dress has in this lighting, it looks far less noxious in every other setting. I need to add a modesty panel, but i’m so happy with the back of this costume. All those cute buttons! To finish off the bodice I sewed together three bias cut strips, then turned the edges inward by hand. I sewed it onto the collar, leaving the ends long so they can be tied in a bow. The back of the collar closes with three hooks and eyes before the bow is tied. The final detail was that brooch I mentioned in my last post! The final post about this project should be up in a week or two! And it will go over making the skirt and the hat. 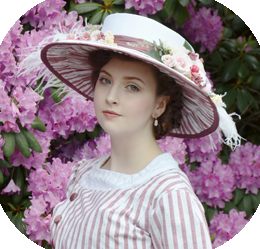 Today I’ll be talking about making another 1890’s day dress from taffeta. But this time around my posts will be a lot more positive since i’ve already finished this dress and i’m really happy with the end result. The finished dress actually fits, and isn’t too long, which might be a first for me! Before talking about construction I wanted to explain the design of this, because if you’ve seen the movie Crimson Peak it may look familiar! 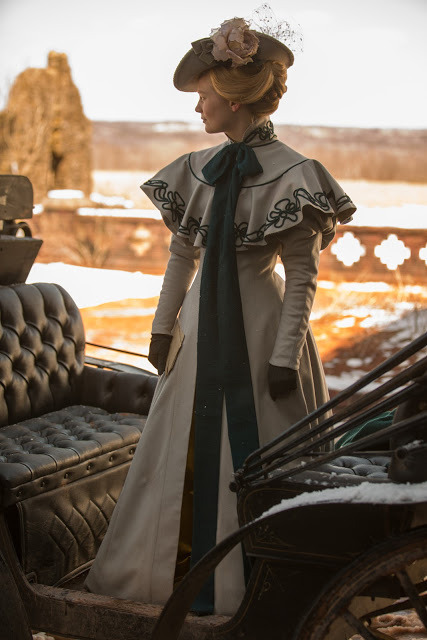 If you read this blog post you’ll know my foray into 1890’s fashion was originally inspired by what Edith wore in the film, specifically this gorgeous coat. Back in January I bought fabric for a coat based on that design, and material for a dress to wear underneath it. Even though I really liked the dress Edith wore with the jacket in the film, I chose to create an original design instead. The design wasn’t the reason why that project failed, but I didn’t want to be reminded of it when attempting another project from this period. So I settled on a simpler design, which features the most common skirt and bodice design from the 1890’s, and the signature puff sleeves. You can see similar designs in Victorian Fashions and Costumes from Harper’s Bazar* which I had open while sketching this ensemble. Since my last dress was very heavy I chose to leave this one free of embellishments and trim, with the only decoration being buttons down the front and a brooch. This was the only thing I intended on copying from the dress in Crimson Peak. But when I compared my sketch to the costume from the film, I realized they were pretty much identical! This was made even more apparent because the fabric I purchased for this project is quite similar to what was used for Edith’s dress. But I like the design, and I like the dress from the film, so i’m okay with them being really similar, even if that wasn’t my original intention. As I said, I used Victorian Fashions and Costumes from Harper’s Bazar* as a reference, along with a bunch of things i’ve pinned and the gown from the film. I purchased seven yards of an orange silk for this dress, and plan on wearing it with this beautiful moth brooch I got for two dollars on ebay. I’ve been wanting to include it in a costume for ages, and I feel like this is my chance – even though brooches this bold aren’t really historically accurate, ecspecially on a day ensemble. And a more developed sketch. I started off by draping the pattern. It’s a pretty simple design, but it took a bit of fiddling to get the amount of volume I wanted while keeping the shoulder and sides perfectly smooth. Here you can see it transferred to paper with the seam allowances added. This picture was taken after I made my first mock up and some pattern changes. Those changes included making the waistband longer, taking the collar in by an inch, adding a dart to the front, and raising the waistline. Just to be safe, since the fit of my first 1890’s day dress was so bad, I decided to cut out and assemble the lining of the bodice first. This would serve as a second mock up of sorts, and allow me to make minor changes before cutting into the silk. I’m SO glad I did this, because some weird issues popped up. The collar was too big (I think I took it in by a full inch), the gathers at the front were gaping, and there was a lot of wrinkling and bunching in collarbone/shoulder area. The wrinkling was weird, since every other part of the bodice seemed to fit fine. I couldn’t find a solution online, or in Patternmaking for Fashion Design * (which everyone says has all the answers) but luckily I found a handy diagram in one of the 1920’s textbooks from the Woman’s Institute of Domestic Arts and Sciences which my Great Aunt gave me. I was skeptical about their solution, since the shoulder seam fit quite tightly, and if anything there was more excess fabric near the collar than the shoulder, but it totally worked! The shoulder seam just needed to be on more of an angle. I guess I’ve never run into this problem before since I don’t make high collar bodices very often. In addition to that, I also took the collar in and sewed a strip of material across the front to control the gathers. In the future I would make a separate lining pattern that isn’t gathered, which would avoid this problem. Here you can see the strip I sewed to the front. After this was done I tried the bodice on again, and it fit well enough that I felt comfortable with moving forward. So I sewed a few boning channels into the lining, then filled them with plastic bones. It’s the wrong fabric and color, but it looks the way I wanted! Now I cut the bodice out from silk. Here is the front panel before I gathered it down. And here it is after being gathered! And sewn onto the back panels – can we just take a moment to appreciate how the seams on this fabric are practically invisible? I was so worried about making a full dress from silk, since the last silk I used was a VERY finicky dupioni that puckered horribly any time a needle passed through it. But this fabric doesn’t have that issue, It sews beautifully and seams disappear after ironing. Plus it has a gorgeous two tone look to it, and the weight is perfect – light enough that it is easy to manipulate, but heavy enough that I didn’t have to interface or flat line it. I want to own this fabric in every color and use it for everything, it’s wonderful. And a quick test on the dress form to make sure the gathered looked okay. Now it was time to add the closures. I chose to make the dress close down the back, and decided to go for something that would be decorative and functional: buttons and loops. I don’t think this is historically accurate, but i’ve wanted to make a dress with this type of closure for years and this seemed like a perfect opportunity. To make the loops I cut out one inch wide strips of silk on the fabrics bias. Then I sewed them into tubes with a quarter inch seam allowance. When it came to turning the tubes the right way out, things got tricky. I tried to turn the first one by hand, with the help of pliers. Which worked, but damaged the fabric and took ages – like three hours to finish one thirty inch long tube. It was ridiculous. For the other two I used the safety pin method of pinning it to one end, then threading it through the tube and pulling it out the other side. This worked way better and took less than ten minutes, so I should have done that in the first place! I ended up cutting the tubes into two inch lengths, then ironing them into the shape seen below. These were pinned onto ribbon, then sewn to the ribbon by machine. The ribbon was then pinned onto the back of the bodice. And sewn on by hand. Not my prettiest hand work, but I went over each loop several times to make sure they are really secure. With the loops on, I went ahead and sewed in the lining. Now it was starting to look like something! But it was still missing all the buttons, which meant I had to make some. I bought a tool for covering 5/8″ buttons, along with fifty loop back sets. These were purchased on etsy for a grand total of nine bucks. A few hours later I had an adequate number of buttons. Though I had to make more later for the sleeves and skirt. Buttons were sewn onto the back, which unfortunately I didn’t take a picture of, and the front, which looks like this! The gathered front of the bodice has a tendency to flop over and hide my beautiful buttons, so I’ll have to do something to fix that. But aside from that I really like it! I love how clean it looks, with the focus being on the color and buttons. It’s interesting working on something that is so bold (a lot bolder than my usual projects) yet really simple by comparison. Speaking of that bold color, i’ve nicknamed this the pumpkin dress because of it! The color probably reminds me of cheetos more than pumpkins, but I think “pumpkin” is a slightly more glamorous name for it. And that’s it for this post! Thanks for reading! It’s odd, last week I posted a set of photos that I really liked, but the photos were of a project I wasn’t very happy with. And this week it’s the other way around! I’m really pleased with this costume, but I don’t think these photos do it justice. I hope to get more photos of it in the future, but with the weather we’ve been having I don’t think that will happen any time soon. On the bright side, I also took video footage of this costume for my Costume Spotlight series, and i’m actually much happier with how it looks there! So if you’d like to see it in motion i’d suggest checking out this video. I’ll be making a page with a summary of this project soon, along with links to all the posts related to it. But in the mean time, all the posts about this costume can be found under this tag – and the post about the foundation garments that are worn underneath it can be found here. These first few photos were taken outside an abandoned church – it’s right around the corner from a bikers bar, and I thought it would be hilarious to go there and get photos of this costume with a “bike” but I wasn’t sure anyone there would find it as funny as me, so I did not. Then we went to a park for more photos. In these photos the sleeves are stuffed to add volume. Sorry for the wrinkly bloomers – sitting in the car really did an number on them! This week i’m writing about the final piece of my cycling ensemble – a costume that already consists of a jacket, shirtwaist, and bow tie. Wearing those things on their own would have been pretty scandalous which is why I decided to pair them with cycling bloomers! My original inspiration for this costume was this ensemble, which features the most fantastic pair of bloomers i’ve ever seen. As soon as I saw them I knew I had to make something similar, and I think i’ve accomplished it! Drafting these was surprisingly easy. I copied the inseam from a pair of modern shorts onto newsprint, then dropped the crotch by almost five inches. I made each piece very wide – almost thirty inches at the waistline, and bigger at the hem. Unfortunately I didn’t take a photo of my pattern, but it honestly looked like giant rectangles with a crotch seam. Nothing too exciting! Since I was feeling daring I cut the pattern out without making a mock up – I figured it was so massive i’ve have enough material there to make alterations if they were required. After cutting the pieces out I sewed across the crotch seams with basting stitches. I was very careful here since I wanted the plaid fabric to line up perfectly. Unfortunately I realized half way through doing this that the pieces weren’t cut out properly and that the plaid wouldn’t line up. I think it’s a small enough print that it doesn’t really matter but I was a bit peeved! I sewed the crotch seams by machine with a one inch seam allowance. The top eight (ish) inches of the front seam were left open, since that’s where the closures will be. I ironed interfacing into the portion of the seam that was left open. This makes the fabric a bit sturdier and should make the front look smoother after the snaps are sewn in. One side of the seam allowance is ironed inward by an inch to create a finished edge. Then I realized I didn’t finish these seams. So I sewed lace tape to hide the raw edges, which was a pain to do at this stage! I sewed snaps into the front panel, placed a half inch away from each edge. I placed these pretty far apart (and used crappy snaps from the garment district) because there won’t be a lot of tension on them. After sewing them on the edge that was ironed inward was whip stitched in place so it won’t flap about. I did up the side seams, and inseam with french seams – here you can see how massive the are! They took almost four yards of flannel shirting to make. And it was time for pleats! I marked them onto the waistline. And pinned them in place using the plaid design as a guide. The pleat pattern I did for this is kind of weird – the front and back are box pleats, with knife pleats that meet in an inverted box pleat at the sides. I didn’t intend on doing that, but it looked best when I started playing around with the fabric. I sewed across the top edge to secure the pleats. And I intentionally chose not to iron the pleats since I didn’t want the fabric to have a structured feel to it. I tried the bloomers on at this point and realized they were really long, so I chopped two inches off the hem. Then I gathered the cuffs down so they were slightly larger than my calf measurement. Now they started looking like pants! After a successful fitting I cut out the waistband and cuffs, which are just rectangles backed with fusible interfacing. The cuffs were sewn with french seams. Then ironed in half so the raw edges touch, leaving a nice folded edge along the bottom. I sewed the cuffs on by machine with a half inch seam allowance – this isn’t my prettiest stitch work, but in my defense this fabric is really thick when it’s gathered! I bound the raw edges with home made bias tape, then ironed them. I folded the top edges of the waistband inward by an inch. Then I turned the two inches on one side inward by a little bit more. This makes it look nicer when they overlap. I sewed across the bottom and side edges with running stitches, but left the bottom edge open since it will be secured when it’s sewn onto the shorts. The waistband is pinned so two inches on one side extend beyond the center front. It was sewn in place with whip stitches, then lined with cotton. I sewed three hooks and bars into the waistband. The bars are an inch and a half away from the center front on one side, which creates the asymmetrical closure. Two decorative buttons were added and that’s it! I’m so pleased with these. The closure is invisible when they are worn and i’m really happy with how the look on. They are really unflattering but have a very authentic looking silhouette. I was a bit concerned the crotch would be too high or low, and the volume would pool weirdly at the sides, but I think they are perfect! And they took less than seven hours to make, which is crazy since I thought they would be the most difficult part of this costume. I have photos of them worn but they haven’t been edited yet (though there is a bit of footage that shows me wearing them in the video about making them), so here is how they look flat. Now onto the hat. I started this ages ago, in March before I had the fabrics for this project. I was sick at the time and wanted a hand sewing project to work on in front of the TV and this seemed like a good candidate. Women’s Hats, Headdresses and Hairstyles* mentioned sailor hats being popular during the 1890’s and I found a few examples of them being worn with cycling costumes, so I decided to make one! Though everywhere says they are made from straw, I didn’t have access to straw. And even though I didn’t have fabrics for this project, I knew it would be based on the color scheme of this piece, and straw would clash with that. So instead I used interfacing and buckram which is trimmed with wire. My pattern for this was really simple, I drafted it after taking large quantities of cold medication and it still turned out fine. The pieces were then covered with wool. The brim is lined with a damask print denim and the top portions are lined with the same cotton I used to line the jacket. Unfortunately I didn’t take any photos of the process. But here is the finished hat! The pieces were sewn together, then I trimmed it with some vintage ribbon and added a few paper flowers to the back. And that’s it! The costume is finished! Photos of it all together should be up soon. I changed the flower orientation on the hat and clipped the ribbon with pinking sheers at the back – I like it better this way! The sporting jacket continues! This post will cover the process of making some big leg-of-mutton sleeves and completing the jacket. If you missed it, part one can be read here, and I have videos about making this project, which can be watched here and here if you’re interested! At this point I was happy with the fit and shape of the jacket, but I thought it was a little bland. As much as I like the wool herringbone, I felt the jacket needed another textile to break it up and make it a bit more interesting. So I decided to line the lapel with a contrasting fabric. I was originally going to use a black cotton sateen, but it looked very stark against the grey. So instead I choose to use some plaid flannel instead (which will also be used to make the bloomers that go with this jacket). I traced the lapel and collar onto the flannel, then cut out two pieces. I folded the edges inward by a half inch so the flannel sits a half inch away from the edge of the lapel. Then I redid it a bunch of times to get the plaid pattern symmetrical! Then it was sewn in place with slip stitches. With the lapel and collar finished I was finally able to sew up the shoulder and side seams. I finished the armholes with strips of bias tape that were sewn on with the right sides of the material facing each other, then turned inward and sewn down. This was my lazy way of doing a facing since I didn’t want to draft a new pattern. I turned the bottom edge of the jacket inward by a half inch and hemmed it with small running stitches. Then I put the jacket on my dress form to see how it was looking – and I was really happy with what I saw! The side seams and hem added some shape to it, and I think the plaid lining made a huge difference. It really highlights the lapel and makes the design come to life! Now I could move onto the sleeves! These were the part I was most excited about, but also the part I expected to go wrong. I’ve never made proper leg-of-mutton sleeves before and I figured getting the fit and shape right would be a challenge. Because of that I decided to use a pattern from the book 59 Authentic Turn-of-the-Century Fashion Patterns by Kristina Harris *. I took a photo of the pattern I wanted, then resized it on my computer, used the screen as a lightbox, and traced the pattern onto newsprint. This pattern is huge – almost thirty three inches long. But believe it or not I probably would have added more volume to the top if i’d had enough material leftover. The finished sleeves don’t look nearly as massive as you’d expect based on the pattern. But for the most part i’m really happy with this pattern. I had to take it in by an inch around the lower arm and that was it! Sort of loving this whole not drafting my own sleeves thing, it makes the process way easier. I ended up adding a half inch to the seam allowances to allow for french seams. Then I attempted to stiffen the tops of the sleeves with netting, interfacing, fusible web, and some other stuff. I figured this would give me lots of effortless volume without the annoyance of sleeve supports. But it made the sleeves look horrible and didn’t really add to the shape of them since it weighed down the fabric. So I ripped all of that out, which luckily didn’t damage the material. But it did leave behind some glue residue on the interior which you can see below. Once that failed attempt was taken care of I went ahead and sewed the french seams. And I had two very odd looking sleeves! Then I gathered the tops of the sleeves down to fit the arm holes in my jacket. This was done by hand with running stitches, as per usual. Then I pinned the sleeves onto my dress form to see what the shape was like. I think I stuffed them with a bit of quilt batting for these photos but I can’t remember. They hold their shape much better when they are worn (my arms bulk them up a bit, and the undershirt makes them less prone to collapsing) but the batting definitely helps exaggerate the leg-of-mutton effect! Either way I was pretty thrilled with how they were coming along! I finished the cuffs with strips of bias tape that were turned inward to hide the raw edge. These were sewn in place with hidden whip stitches. And the top edge will be covered by the jackets lining, so I didn’t have to cover it. They got pinned onto the jacket..
And sewn in place with two strands of thread and lots of tiny whip stitches. Then I pinned the lining in place. This was a huge pain, it took me hours which is ridiculous. I think if I made another jacket similar to this I would try flat lining the pieces and finishing the edges separately (which was often done during this period). It’s just too difficult to get the lining to match up with the jacket, and i’m always worried it will effect the fit. I sewed it in with whip stitches – except for around the hem, I used running stitches for that. And then the final step was sewing on buttons! I used La Mode buttons in the style 219. They are stitched one and a half inches apart and half an inch away from the seam line. Here they are after being sewn on – part of me wishes I’d used larger buttons that don’t have a pattern, since these kind of get lost in the herringbone print. But I still really like them! And that’s it! I’m so pleased with how this turned out. It fits really nicely, even without a closure method. And the sleeves look so good. I was really worried they would look silly or end up being too big, but they are actually quite fitted while still having lots of volume. I love the plaid material at the lapel. I debated about whether to add that or not, and i’m so glad I did. In addition to making the jacket look better I think it will really tie the look together when it’s paired with matching bloomers. I’m also happy with the back seaming on this jacket. When I ordered the wool for this I was a bit concerned it would be too heavy to pull off the seaming, but it worked perfectly! And the thing i’m most happy with is that I learned from the mistakes I made on my last fitted jacket and managed to properly execute the collar and lapel. The only things I wish I could change are related to fabric quantity – which is my own fault. If i’d ordered another yard I could have made the jacket longer, and the sleeves a bit bigger which would have made the silhouette more dramatic. But even without those changes I really like the end result. And I can’t wait to show you guys how it looks with the shirtwaist I made to go underneath it – but that will have to wait for another day! And I wanted to mention that from now on a “*” after a link will indicate that it’s an affiliate link. I thought this would be a nice non-intrusive way of (potentially) making a bit of money off what I post here. I promise affiliate links will always be relevant to what i’m talking about and marked with an asterisk. As a reader I don’t think you will notice any difference, but I wanted to make sure you were aware! That’s it for this post! Thanks for reading! So it’s been a while! Sorry about that, none of my projects were in a good stage to write about so I decided to take a week off. But now i’m back, with new projects and lots to blog about! Todays project is one i’ve had planned for ages but didn’t get the material for until recently. It’s a late 19th century cycling costume that consists of a jacket, pair of bloomers, shirtwaist, and hat. I’d originally planned on making the costume without a jacket, and basing it almost entirely on this ensemble. But then I was contacted by organiccottonplus.com who asked if i’d be interested in reviewing one of their materials, and they had a wool herringbone that went perfectly with the fabrics I had already purchased for this project. So I decided to add another piece to the costume, and i’m really glad I did because I think it turned out wonderfully! Eventually the jacket will look like this, but this post is just about the beginning stages of making it. I’ll talk about materials first. The bloomers will be made from a plaid flannel shirting and the shirtwaist from a striped cotton. The shirtwaist will close with snaps and vintage shell buttons. For the jacket I purchased black buttons from Joanns in the style 219. I also have some grey ribbon to make a tie out of, and plain black wool for the matching hat, but neither of those are pictured. The jacket will be made from two yards of that wool herringbone I mentioned, in the grey/black variation from OrganicCottonPlus.com. I really like this fabric, and i’m not saying that because I was sent it. It’s the type of material I would pick up if I saw it in a shop because it has a really beautiful subtle texture and print to it. I think fabrics like this make a relatively plain jacket look a lot more interesting without overwhelming the design. I was a bit worried when I ordered this that the grey/black would have too much contrast, but that wasn’t a problem at all. The color variation adds a lot of depth to the material without making the print look busy. It’s thicker than a typical suiting but not so heavy that it’s difficult to work with. I actually quite like the weight of it, since it makes the jacket look a bit sturdier which fits the purpose a cycling/sporting jacket would have in the 1890s. Overall it was really nice to work with and I love the texture it has! It’s a bit outside the price I would usually pay for fabric, but I think it’s reasonably priced considering it’s 100% wool and made in the USA. The listing for it is here if you’re interested. Now onto the making and designing of the jacket! The most difficult part of this project was coming up with the design. I didn’t have enough material for a double breasted jacket (which were the most common), the jackets that buttoned at the front were a bit more modern looking then I wanted, and the open front jackets looked quite similar to the plaid jacket I made recently. After looking through dozens of pinterest boards and books I decided to flip through the vintage magazine my Great Aunt sent me and I found a perfect design on the first page! It has the big leg of mutton sleeves I wanted, a flared skirt, and a really interesting boxy lapel. I made a few small changes to that design and decided on some interesting back seaming. Then I sketched it all out so I would have a better reference to look at when draping. The draping process took a while since I kept changing things, but it wasn’t too difficult. The only part I struggled with was getting the collar to look right. The proportions in my reference photo and sketch wouldn’t transfer onto the dress form so it ended up being a bit higher and less boxy than I had wanted. All the pieces were unpinned from the form and ironed. Then I transferred them onto paper. I lowered the waistline of each piece by a half inch, made the flares a bit bigger, smoothed out uneven edges, and added seam allowances. Here is the finished pattern. I made a mock up for it and tried it on. The side seam needed to be taken in, but I was expecting that because my shape when wearing a corset is very different from the shape of my dress form. There were a few other minor alterations like making the arm openings more narrow and lowering the hemline, easy stuff. I’d originally planned on adding an extra inch and a half to the hem so the length would be similar to my reference photo. But after making the mock up I realized how much fabric this pattern takes to create, and I didn’t think I would have enough material to accommodate the hem addition and big leg of mutton sleeves. So I only lengthened the pieces by a half inch. And after the other alterations were made I pinned my pattern in place. As I did this I made sure each piece lined up with the grain line and herringbone print. After pinning everything down I had six inches of fabric left over – and that’s before cutting out the lapel lining and collar. So it was a little bit tight, but a better end result than I was expecting. I thought I might have to take down the sleeve volume which would have been a shame! The lapel lining was cut out as two pieces, cutting it the other way would have the herringbone print going horizontally and I didn’t want that. This seam wasn’t visible in the end anyway. Here are all the pieces (except for the sleeves – i’ll talk about those in part two) cut out! And here is the lining cut out – i’m using a polka dot quilters cotton because the print made me happy! Then the pieces got sewn together. I sewed all the back panels together, and the two front panels together, but left the side and shoulder seams open to make the lapel and collar easier to sew. This is before ironing, but right away you can see the shape start to form! It looks extra snazzy on the dress form. I really love the flared back seaming, it’s easy to do but looks so pretty. With the back done I moved on to the lapels and collar. I learned on my last jacket that these should be done as part of assembly, not an afterthought. So I went ahead and fused interfacing to the wrong side of the front panels, the lapel lining, the collar, and the collar lining. I made sure the interfacing didn’t extend into the seam allowance since I didn’t want bulky edges. Then I pinned the collar to half the shoulder seam, which was pretty much the most confusing thing ever. I kept trying it on and repinning things to make sure I had it right. The seam was sewn then ironed so everything was flat – here is the shape of the lapel/collar lining. The lining was pinned to the right side of the front panels, then sewn in place with a half inch seam allowance. I clipped the corners and turned the jacket the right way out. Then I used a colored pencil to make sure all the edges were nice and pointy and pinned them in place. This went so much better this time (yay for figuring out correct sewing order!). I also left enough room for the collar to turn outward, so I didn’t need to sew on an extension like I did with my plaid jacket. It’s always nice when you can learn from past mistakes! I sewed around the edge by hand with small running stitches and that was pretty much it! Even though I didn’t love how it looked on the mock up, I really like how the collar shape turned out. I did end up trimming the hem a bit at the sides, since it dipped lower there than at the back which looked kind of odd. Look at those seams, I love them. And that is everything for this post! Next time i’ll talk about the sleeves and finishing details.